If you are a Filipino and you are a huge fan of the HBO series Game of Thrones, then you are going to love this interesting bit of information about Stannis Baratheon's armor. We have reasons to believe that the Lord of Dragonstone's armor was inspired by armor that used to be worn by the Moro people in the Philippines. If you look closely into the details and patterns of Baratheon's armor and compare it with a Moro armor, it's not that hard to see the uncanny similarities. These similarities were first observed by Matt Easton, a martial arts teacher and arms and armor researcher from London, England. Easton also runs Schola Gladiatoria, a historical European martial arts group. Easton has a YouTube channel where he uploads videos wherein he talks about historical martial arts, military history, antique arms and armor, basically anything that has something to do with combat. 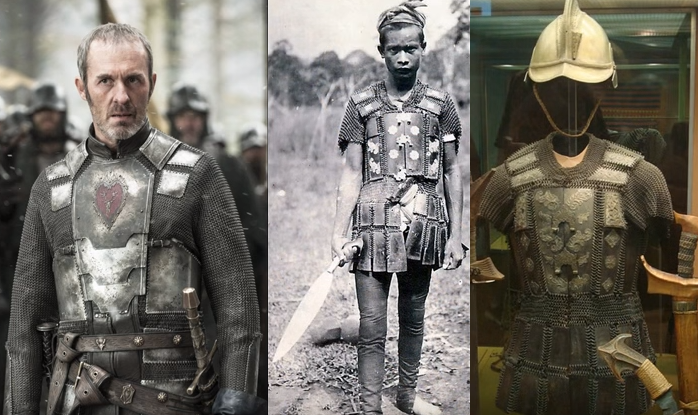 In one of his videos, Easton discussed Baratheon's armor and made the assertion that it was directly inspired by the design of armors worn by the Moro people in Southern Mindanao. And if you are to compare the two armors, Easton may be up to something. The armors do look alike. The patterns are too similar to each other to be brushed away as a mere coincidence. There's only one way to confirm that Baratheon's armor was indeed inspired by Moro armor. And that is to get hold of Game of Thrones's costume design team and ask them where they got the inspiration for Baratheon's armor. Sadly, we don't have that power. But based on Easton's observations and the photos below, it's very likely that Baratheon is indeed dressed in Moro-inspired armor.